I received a Wendell August product for the purpose of this review. This post was made possible by Mom Spark Media. Thoughts are my own. It’s wedding season, and that means time for fun parties, romantic unions, and of course buying wedding gifts. My boyfriend Chris and I attend at least 2 weddings a year so we are pretty well versed when it comes to gift giving, especially since we also give gifts for the weddings we will not be attending. So you can imagine my excitement when I was given the opportunity to try the Wendell August Waterfall salad bowls. While the bowls could be purchased for several gift occasions, I immediately thought wedding. In this review, I will tell you more about this set and why it is the perfect wedding gift. Before I can detail my experience with the bowls, It is best I tell you a little about the company. Their flagship store is in Grove City, PA and they have been creating American made products since 1923. With this being said, they are America’s oldest forge. What is a Forge you say? I’m glad you asked because I found this definition on their website lol! So if you were wondering, the answer is yes, it is true that each product is still handcrafted by their artisans in their Pennsylvania workshop using their original 8-step process. So this means that no two items they create are ever the same. Pretty cool huh? Since their products are so unique, it just makes sense to give any gift from them to someone you love on a special occasion. Their motto is actually, “We create gifts for life’s special moments,” so that gives you a good idea as to why they make products that are gift material. So if you can’t tell from my Anora Cotton Quilt Review, I am a fiend for beautiful packaging. I love to see when a company goes that extra mile when sending a package, and yes I can be a little judgy when I get something that does not package perfectly. (I’m an Apple person, what can I say? lol) And I have to say that I was impressed with the packaging for these bowls. Since the Bowls were a set they came in a HUGE box that had two smaller boxes in it. One box contained the big salad bowl and the other had the set of smaller bowls. The bowls came complete with more info about Wendell August and detailed instructions on cleaning and caring for your bowl and its aluminum finish. Once I unwrapped all the bubble wrap and looked over all my bowls, I was very impressed at how nice it all really looked. I thought about all the occasions to use these babies. I know it’s a salad bowl, but I could see so many opportunities to use this. I could use it for dips for a party, punch for a party, or for a regular salad or fruit salad for a barbecue. Any occasion I could have at my house I thought that these bowls could be used. Since they look so good, they pretty much go with any type of decor you decide to have for a get together at home. Why is it a Good Wedding Gift? Now for the big question. Why does this make a great wedding gift? Honestly, because it is a beautiful set of high quality. As any previous college student knows, when you are in school you get used to having items that are not of the best quality. And by the time you get to the “real world,” it is nice to finally get some items in your home that are going to last a while. As marriage is a rite of passage in any couple, so is getting some quality items in your household. And what better occasion to get something of quality than a wedding? 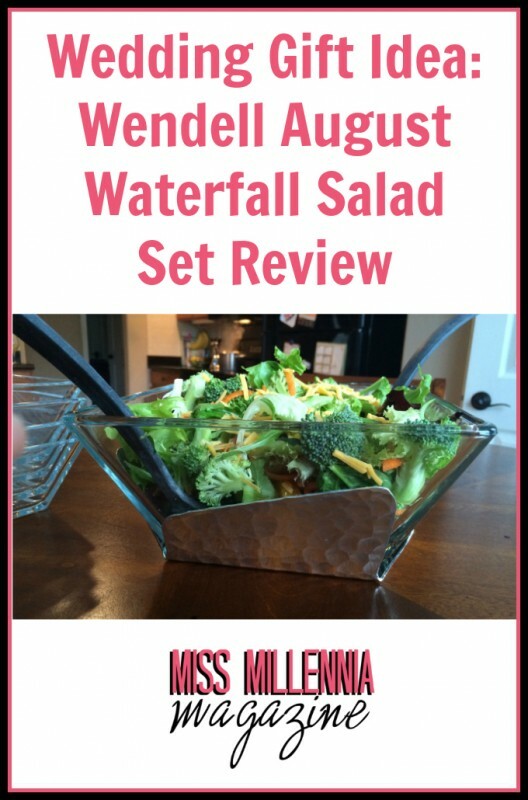 I love my Wendell August Waterfall Salad Set and for all my guests, you should get used to seeing it pretty often, I have every intention of showing it off. 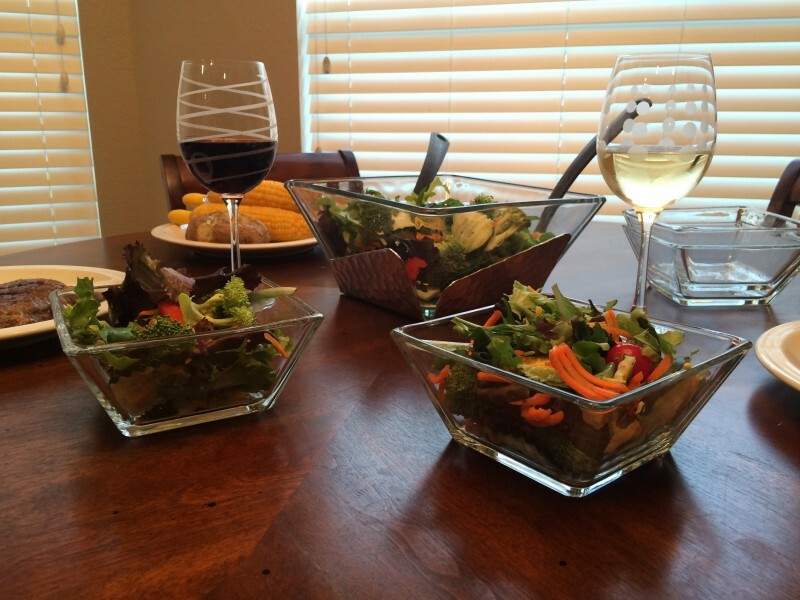 What are some other uses for this salad bowl set that I may have missed? Answer in the comments!